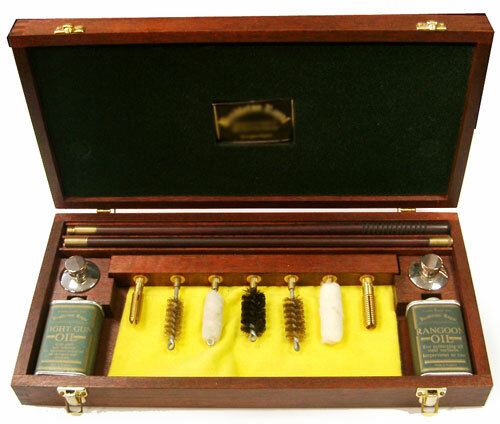 MAHOGANY CASE TWIN CALIBRE COMBINATION SET CONTAINING A TWO PART CLEANING ROD, TWO TRADITIONAL ROUND NICKELED OIL FLASKS, 4.4 FL.OZ CANS OF RANGOON AND LIGHT GUN OIL AND A FLANNEL DUSTER. THERE IS A SEVEN PIECE LIFT OUT BRUSH RACK HOLDING A BRISTLE COMBINATION BRUSH, 2 WOOL MOPS, 2 BRONZE BRUSHES, 2 BRASS JAGS. SIZE 18 1/4" X 9 1/2" X 3"